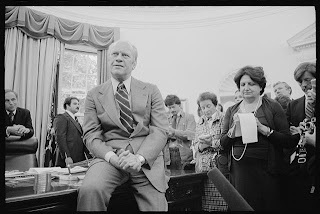 President Ford with reporters, including Helen Thomas. Photo: Library of Congress. Several years ago, I picked up a copy of the book “Thanks for the Memories, Mr. President” which was a collection of “wit and wisdom” from Helen Thomas, the dean of the White House press corps. On Saturday, Helen Thomas died at the age of 92. Reading one of her books helped me to better understand both her perspective and her position in U.S. history. When Helen Thomas began her journalism career at United Press in 1943, the United States was in the middle of fighting World War II. It was not until 1960 that she was promoted to covering the campaign of John F. Kennedy. He won the presidency and Helen was assigned by her bureau to the White House Press Corps. Here she remained after the Kennedy assassination and through the administration of Lyndon Baines Johnson. She travelled with the press corps on President Nixon’s trip to China in 1972. 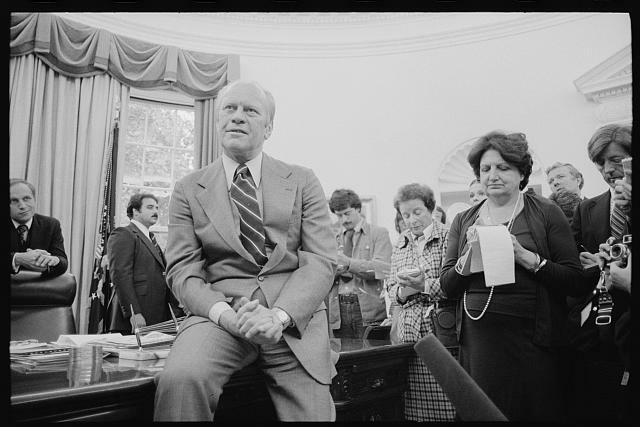 During part of the administration of Gerald Ford, Helen served as president of the White House Correspondents Association. It was only a dozen years earlier that the same organization barred females from attending its annual correspondents’ dinner; now a woman led the organization. When Jimmy Carter was president, Helen Thomas was there. And there she remained during the presidencies of Ronald Reagan, George H. W. Bush, Bill Clinton, George W. Bush and into the first years of President Obama’s first term. Her “ringside seat” to more than a half-century of American history gave her such a unique perspective. Her front row seat in the White House briefing room also gave her the position to speak for those without a voice and to ask the questions which no one else would ask. She believed this to be her mission and lamented that most journalists did not follow suit. And she found Barack Obama’s transparency with the press to be worse than that of Nixon’s. Of course, the fact I learned from “Thanks for the Memories” which I love most about Helen Thomas has nothing to do with what she did. Rather, it is where she was born. In 1920, Helen was born right here in Kentucky — Winchester, to be precise. 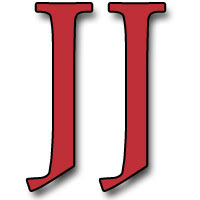 This column originally appeared in the Jessamine Journal. It should not be republished without permission.